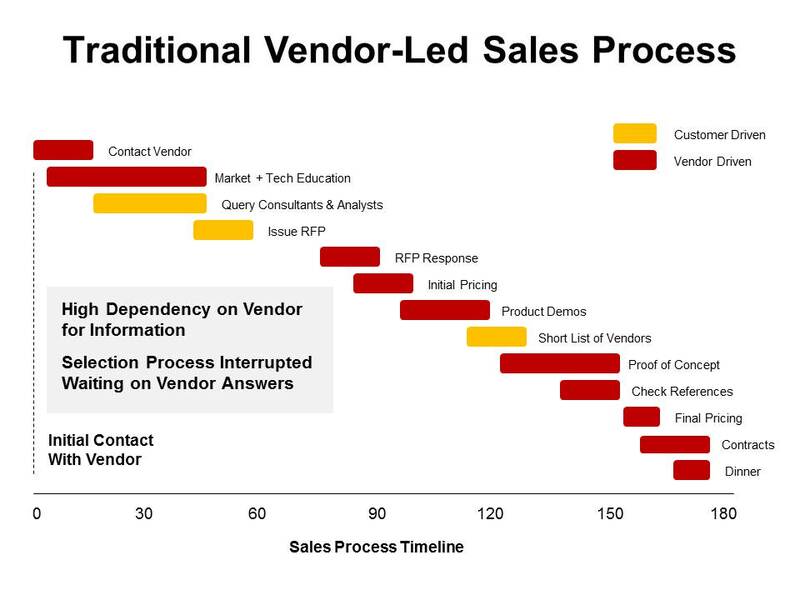 In the traditional technology sale, customers were dependent upon the vendors to move through a sales cycle. Vendors were engaged early in the process to provide much of the information about a particular technology. Much of the education process occurred face-to-face as the vendor talked prospective buyers through the features and benefits of their offerings. Additionally, vendors shared documentation such as technology primers, product data sheets, white papers and technical specifications with customers. Vendors were not the only sources of information. Analysts and consultants were also heavily leveraged to gather key requirements, define the business case and evaluate competing vendors. However, even these experts were somewhat dependent upon engaging vendor sales representatives to gather information about the features and benefits of their competing offerings. 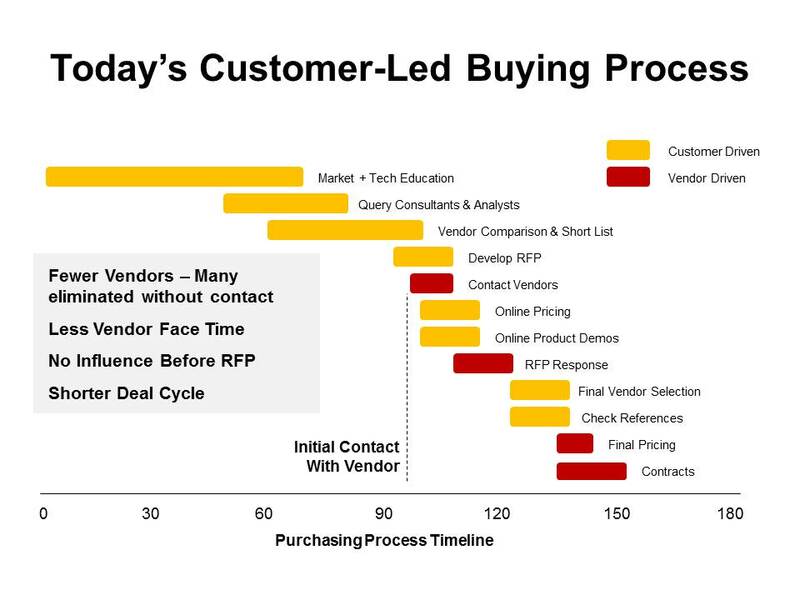 The first phase of the sales cycle ended with the customer issuing an RFP to a “long list” of vendors. The prospect could then sit back and wait four to six weeks while the vendors worked on written responses. Today the process is very different. Customers are not dependent upon the vendor to conduct research necessary to write an RFP. In fact, in today’s model the customer is driving a buying process (rather than the vendor leading a sales cycle). Today’s buyers don’t need to engage the sales representatives to gather information about the technologies they are considering purchasing. There is a wealth of information on publicly available websites. Media sites such as Information Week, BitPipe and ComputerWeekly are littered with buyer’s guides, white papers and vendor comparisons for most of the popular technology categories. The pros and cons of various technologies are publicly debated on blogs, social networks and user forums. A new generation of research analysts has developed open business models which freely share technology primers and vendor analyses online. In the traditional technology sale, the vendor selection process was also critically dependent upon gathering information from the vendors. For example, the vendor was the only real source of pricing information. To actually view a software product a series of hurdles needed to be overcome. The schedules of various internal stakeholders had to be coordinated to schedule a live on-site demonstration. Not only did this take weeks to coordinate, but it cost the customer thousands of dollars of travel expenses to fly the appropriate people in for the meeting. If the customer wanted to conduct a proof of concept prior to selecting a vendor then another series of hurdles must be overcome. The vendor also needed to arrange for a special trial-version of the software license to be installed on the customer’s premise. Once again, a technical team from the vendor must travel to the customer’s location to supervise the process. The customer must wait for the vendor to supply a list of references, which can be contacted via phone to provide their comments on their experience with the product. However, today’s buyers don’t need to move this slowly. Many vendors publish their pricing on their websites. As a result the customer can perform cost estimates for budgeting early in the process then model comparisons between providers as they narrow their preferences. There is no need to wait for a sales engineer to provide an on-site demo. Each stakeholder can view an online demo whenever they want on the vendor’s website. The proof of concept is not delayed by licensing keys or onsite installations. Customers can conduct a free trial online by simply registering online. And buyers are no longer dependent upon a vendor providing a list of references to call. These reference checks can easily be performed by reaching out to existing users on social media tools such as LinkedIn and blogs. Although, buyers are not dependent on vendors for information they may still seek them out if the content they offer provides value. That is why your website should be content-rich with white papers, webinars, case studies and collateral that explains how you can help your customers to solve their problems.